We don't want to go anywhere "just because". Over the years, we've met and developed travel buddies that we travel with from time to time. One couple had just inherited a summer "hutte" on the island of Varaldsøy in the Hardanger fjord, and we were invited to come and visit. Grandpa and Granny came from Norway. Because of that and because of our travel buddies, we've been back several times... exploring in different ways like we did in 2017. Here's the story of that first trip to find our roots. Combine a visit to friends with the fact that I'm half Norwegian (my maiden name was Fiksdal), and we had two great reasons for exploring Norway. In our early travels, we had visited Oslo, Bergen and Stavanger, but now it was time to try to find Grandpa's home town. Genealogy is not one of our active interests, but we thought it would be fun to see if any of my cousins knew where Granny and Grandpa had come from. Sure enough one of my cousins is into genealogy. If you can connect with people in countries you visit, it makes it so much more fun and meaningful. Cousin Shari also was in e-mail contact with a fellow she knows in Norway through a post polio support group. She put us in touch with him. We had a couple of days in the country before we were supposed to meet our friends, so we arranged to meet Harald once we arrived. The internet and e-mail make this all so much easier. If you can find a friend of a friend.... do it... even a brief evening with someone makes the trip seem more like a visit than a tour. We flew to Oslo and phoned Harald to get direction, then drove two hours north to meet him and take him to dinner. My cousin had sent her family information ahead, and with a little research, Harald was able to tell us where the old family farm had been. 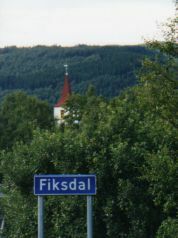 There actually WAS a town of Fiksdal, but, he told us, it would take about 8-10 hours to drive there. We were supposed to meet our friends in a day and a half by now, but really, did we have a choice? Mark is really a good sport, so we got up, had an early and hearty Norwegian breakfast, and went to find Fiksdal. Our impression of Norway as we drove through in mid-June was that the country leaks. There were beautiful waterfalls everywhere. The lupines were in bloom splashing pinks and purples across the decidedly green mountains and meadows. The small towns are charming and colorful too. The Norwegians tend to paint their houses in happy, bright colors. I started getting really excited when we spotted the little group of buildings from across the fjord that we thought had to be the town we were looking for. What a thrill it was to come around the last bend in the road and see the road sign for the town.... Fiksdal. ...the spire of the Fiksdal Kyrkje (church). That first time, we arrived in Fiksdal on a Sunday night, and no one was about. That was probably a good thing, because we really didn’t have time to linger. We had to turn around almost immediately to start back down the coast. But I was elated that we had found the spot that my Grandpa had come from! We drove for five more hours that night. Thank goodness it never got dark. Remember you are pretty far north, so if you visit close to the summer solstice, the days are very long; all you really get is a few hours of twilight during the night. The next morning we drove for another five hours across more ferries and fjords. We made it to the Bergen airport on time to meet our friends. Ferries are a way of life if you're driving the coast of Norway, and they're fun and scenic. Ferries run on frequent schedules, and you'll rarely wait more than 20-30 minutes for them. Language is not a problem. But if you're lucky it can also be warm and sunny like it was for this hike. What a view, eh? Even with some showers, we explored the little island and the nearby area, swam in the fjord, and enjoyed the quiet and the breathtaking scenery. Just for fun we all danced around a bonfire for the summer solstice. We went back two years later. We really didn’t feel like we had enough time in Fiksdal; we wanted to see Harald again; and we had another invitation to visit our friends on their island hideaway. So again we rented a car at the Oslo Airport and got as far as Elverum to have dinner with Harald. We were prepared to do a little more sightseeing this time. It's an interesting itinerary you might want to take. When we left Harald, we headed through the middle of the country to Røros to explore that quaint old mining town. There were lots of restaurants and shops to explore.... a mining museum and plenty of hotels if you wanted to stay there, but we drove on. 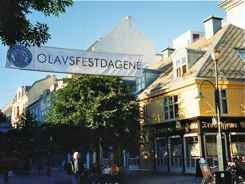 We drove north to Trondheim where we were just in time for the Olavsfestdagene (St. Olavs Festival). It's always fun when serendipity throws a local festival in your path... if you try to participate and explore the local traditions when you come across these festivities, travel is even more fun. For a whole day this time. We got to talk to some of the residents and get into the little Fiksdal Church. The general store is where they keep the genealogy books for the area. I have no relatives left in the area, but that didn't keep people from wanting to help us. They pulled those genealogy books out out and tried to look up our ancestors..... I couldn't read them, but we had no shortage of interpreters. People in small towns like this really want to help make your visit special. They even called the little old caretaker of the church so that we could see the interior this time. We stayed about a hour away in Ålesund where we had dinner with another “online” friend of my cousin Shari. It really does pay to get in touch even with friends of friends. We met some locals who said we must be long lost cousins if Grandpa came from Fiksdal, and they were quick to offer advice on the most scenic route south. Ålesund is a beautiful coastal town, and a great gateway for a drive through some of Norway's most beautiful fjords. 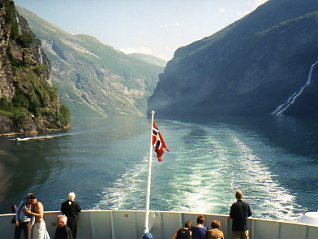 Fjord, fjord, fjord.... all with ferries. 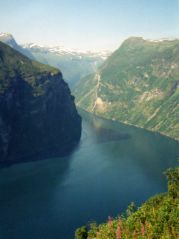 It was beautiful, and we can heartily recommend this Fjord Drive. 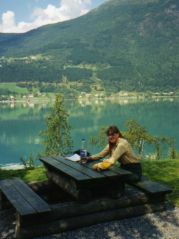 Norway tends to be expensive, so one way to economize is to picnic. You can't beat the scenery at the road side tables provided. 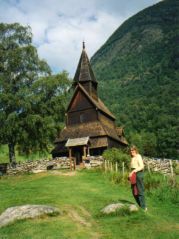 We stopped to see Stave churches and explore charming small towns along the way. Eventually we reached the Hardanger Fjord where we made our way back to Varaldsøy Island and stayed three days. Our friends have indoor plumbing since our visit two years ago, and peak-a-boo views of the fjord through the trees. 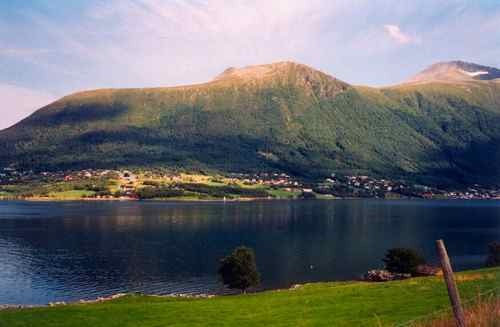 The weather was so great this time that we went swimming in the fjord every day, and we were running around in bathing suits picking wild blue berries late in the evening. They made for great pancakes the next morning! What a treat a visit like this is. Norway has a lot to offer. Cosmopolitan Oslo has museums, churches and grand buildings you would expect in any European capital. There is also the Bygdøy neighborhood across the harbor from downtown with the Norwegian Folk Museum and other museums featuring Norway's Viking and seafaring history. 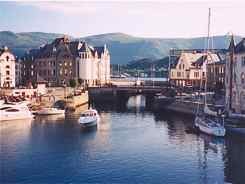 Historic Bergen is delightful to visit with it's colorful waterfront and historic Hanseatic Quarter. 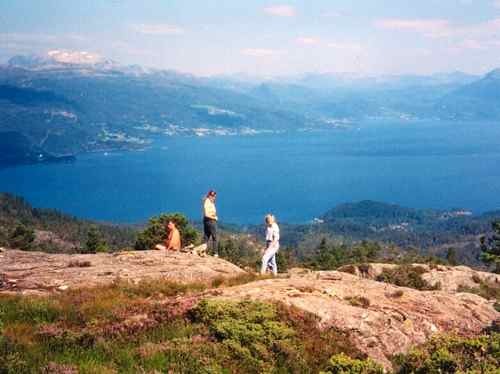 And if you want to get a feeling for the countryside in between these two cities, you can enjoy "Norway In A Nutshell".... a well-organized series of bus, train, and ferry connections that will get you between Oslo and Bergen in a day trip. Language is generally not a problem in most of Europe. English is a strong second language, and you will have no problem getting hotels and meals. Buying your tickets on the ferry will almost always be done in English. But learn a few words, and use them. Please, thank you, hello, good bye.... even these few will go a long way in establishing that you are trying. Carry a phrase book and point if nothing else will work. If there is any way to hook up with friends or long lost relatives or even a long lost ancestral home, it takes you away from the usual tourist sites, and it will give you wonderful adventures and memories. Harald came to visit us this summer, and I’m sure we will return to Norway again. So look up friends and family, and plan your trip! We're busy planning our next trip. Check to see the process we use, the frustrations we work through, and the triumphs we celebrate. The trip is always worth it.